Eight firefighters and a gas company worker were hurt Thursday in a gas explosion next to a pregnancy clinic at a Maryland strip mall, authorities said. The Penn Mar mall is next to the Forestville Pregnancy Center, and an official there called 911 after smelling gas. There were no clients at the pregnancy center at the time of the explosion. 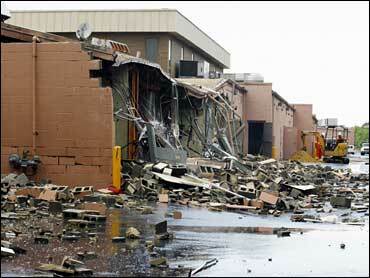 The blast caused significant damage. Debris and rubble could be seen strewn across the center. "I thought a bomb had dropped on the building. It was so forceful," witness Felicia Price told CBS News. Crews were called to the Prince George's County shopping center just before 1 p.m. The gas company employee who was hurt was working on a gas line at the time of the blast. Brady said two firefighters were admitted to the burn unit at the Washington Hospital Center. All other victims were treated and released at local hospitals. "We've ruled out anything sinister or suspicious," Brady said. Jeanette Zak, a board member of the Forestville Pregnancy Center, called 911 to report the leak. She said she watched from her car as firefighters tried to get into a vacant storefront next to the center. Then the store exploded. "I could feel the heat from my car ... and kind of the whoosh of the air," Zak said. She said she felt fortunate that she called 911 in time and no one at the center was hurt. Ordinarily, clients would have been receiving counseling, but the counselor who works Thursdays had a medical appointment. Zak speculated the gas leak might have been caused by recent renovations in the empty storefront.